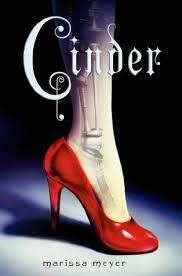 Cinder, the debut novel by Marissa Meyer, is about a very gifted mechanic. The story is a fantasy. When most people think of fantasy they picture dragons, talking animals, and fairies. However Cinder is a inspiring story of a peasant who is considered as a technological mistake. Her stepmother calls her this because of her physical deformities and is called a “non existent mechanical cyborg”. But her friends, mostly robots, see the real girl behind the mechanical leg braces because they share the same features. Being the inquisitive tomboy that Cinder is, she wouldn’t fit into a ball even if the prince or anyone had asked her. Although, she was very tempted to go. However she changed her mind after the townspeople, who seemed to be nice, started calling her a “technological mistake” which the whole village had heard her stepmother say out loud. I really enjoyed this modern, action filled, fantasy. It is such a page turner that motivates you to read. The plot of the story is also very inspiring. It talks about showing who you really are instead of hiding behind your shadow, because letting people know who you really are is more important than the mask you put on. It was also very fun to read because each chapter has something exciting going on even if it seems boring at first, however the plot progresses as each page turns. Cinder is a great tough-girl character who can fix anything and acts selflessly to help those in danger.